Irish coffee is a great way to celebrate a holiday, or even just to end a long day… when it’s made well, that is. When it isn’t, it can become a cup of overly sweet, insultingly tacky crud. The truth is, knowing how to make Irish coffee well can be tricky. You want a recipe for Irish coffee that doesn’t end up ruining the stuff, right? 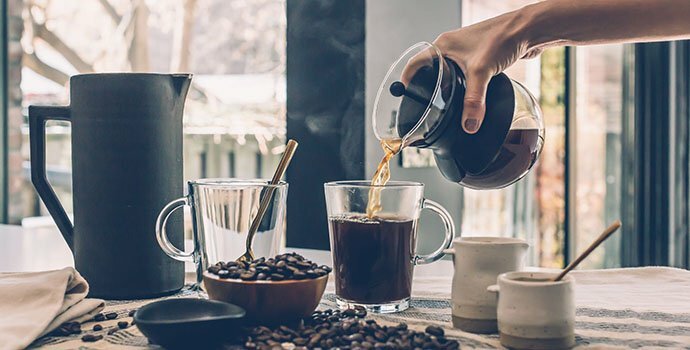 Here’s our pick for a recipe that maximizes the delectable aspects of this sweet-yet-strong drink, while still respecting the coffee that forms its essence. The classic and timeless Irish Coffee - Craved by many, but mastered by few. This is a simple yet authentic recipe for a gorgeous Irish coffee. It will pick you up and throw you down at the same time. Combine the brown sugar and coffee in your cup. Add the Irish whiskey into the mixture and stir thoroughly. Pour the cream over the back of the spoon very carefully. Optional: Add a sprinkle of ground nutmeg on top of the cream as garnish. Unsweetened cream is best, as the drink is already very sweet. You’ll want the whipped cream to complement, not compete with, the rest of the drink. While some recipes may try to use espresso, just regular brewed coffee is the way to go here. Get your ingredients ready beforehand and time your coffee brewing to have it as hot as possible. Preheat your vessel to help keep the coffee warm as you assemble the drink. (#4 on our list of ways to keep your coffee hot). Choose a stylish, glass vessel. Believe it or not, it will affect the taste. Don't skimp on the whiskey - use a top quality brand such as Jamesons Irish Whisky. The cafe has remained a source of some of the best Irish coffee in San Francisco ever since. However, while its popularity exploded from there, the beverage was not actually invented in San Francisco. Its creation dates back to nearly a decade earlier. In 1943 (or 1942 according to some sources), Joe Sheridan first invented the cocktail at his coffee shop in an airport in Limerick, Ireland. He was asked to whip up something to refresh a group of passengers who had returned after a flight had failed to reach New York due to some nasty winter weather. When asked if the coffee was Brazilian, he replied that it wasn’t. It was “Irish coffee,” and the name stuck. You can get more on that story in Felicity Cloake’s article here. The Coffee - While you can use espresso in Irish Coffee, it’s a powerful addition to what is already a strongly-flavored drink. We recommend a batch of regular brewed coffee. The Sweetener- which is essential here, whether you’re a fan of sweet coffee or not. It’s not only for the flavor, though – it actually helps keep the cream floating on top! Some recipes use straight white sugar while others use brown sugar, molasses, or a combination of sweeteners. The Whiskey - The star of this drink, Irish whiskey, is what really ties this drink together! Make sure you get the good stuff or you’ll be shooting yourself in the foot before you even start. The Cream - Irish coffee without cream is like peanut butter without jelly. However, the kind of cream used can vary dramatically from one recipe to the next. The thing that does not vary, however, is the challenge of getting it to float! In general, if the coffee is very hot, the cream has a high fat content, and the cream isn’t over-whipped, you’ll have a better chance of getting it to float and not mix in on contact! While there is no single best version, there are quite a few variations on this popular Irish drink. Here are a few of them! This version uses Baileys Irish Cream instead of (or in addition to!) whiskey, and is sweeter with a fuller body. This version has lightly whipped cream. It also uses two sugar cubes for the sweetener. This one is simple. It’s usually just Kahlua, hot coffee, and Irish Whiskey or Baileys. This one uses half Irish whiskey and half Baileys. It’s also topped with a Maraschino cherry, adding a splash of color. Irish whiskey, brown sugar, lightly whipped cream, and of course, coffee! Simple ingredients thoughtfully put together to create an authentic, high-quality drink. If you tried the recipe, we’d love to hear how it went for you. And with so many variations, tell us about any other versions you’ve tried. Leave a comment below!